Robert B. Townsend is the director of the Washington office of the American Academy of Arts and Sciences, co-director of the Humanities Indicators, and the author of History’s Babel: Scholarship, Professionalization, and the Historical Enterprise, 1880–1940 (Univ. of Chicago Press, 2013). 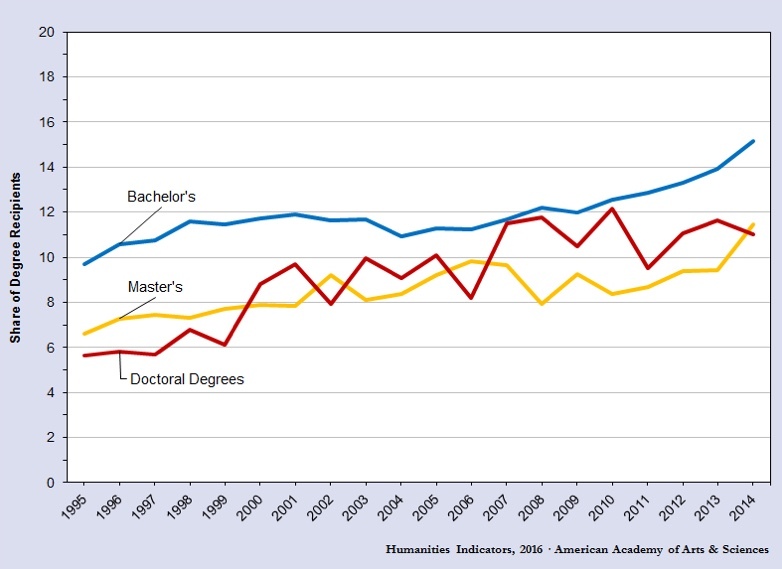 History bachelor’s degrees are falling sharply while doctoral degrees in the discipline continue to rise, according to new updates from the Humanities Indicators. At the bachelor’s level, history degrees fell 9.1% (to 30,810) in the most recent available year—marking the largest one-year decline since 1978 and the smallest number awarded since 2004. As a share of all bachelor’s degrees conferred in 2014, history fell to levels last seen in the 1980s (Figure 1). While the number of bachelor’s degrees was dropping, the number of doctoral degrees grew for the fourth year in a row, rising to 1,043 PhDs awarded in 2014. This is the largest number of history PhDs ever recorded, even as the discipline is now five years into a weak academic job market. Despite the growth, history’s share of doctoral degrees has been relatively flat in recent years due to increases across most academic fields. 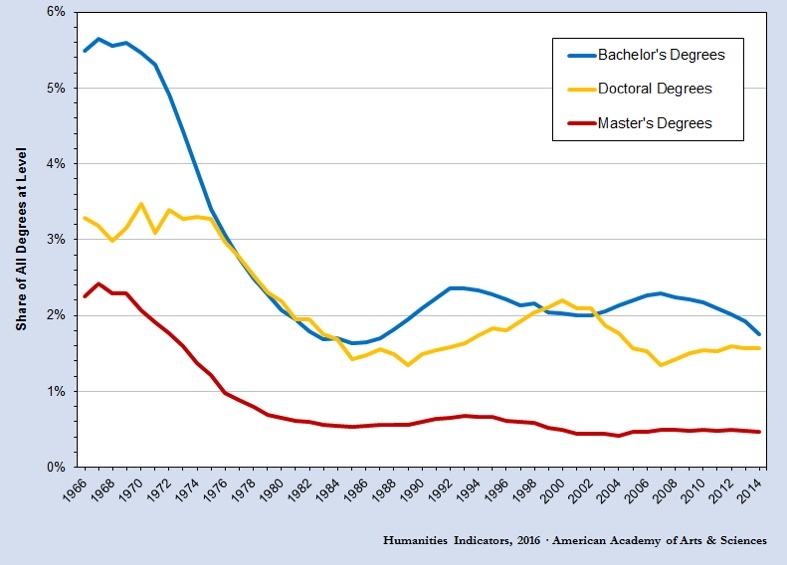 The number of master’s degrees awarded in history followed bachelor’s degrees downward in recent years (from a recent high of 4,038 degrees awarded in 2012 to 3,702 degrees in 2014). In the past, doctoral degrees in history have tended to fall a few years after declines in master’s degrees, so the recent drop may provide an early indicator that the number of PhDs will soon fall. One of the headwinds history has faced for decades is the relatively small shares of women and underrepresented minorities earning degrees in the discipline, which lagged behind the student populations of other academic disciplines. History gained ground in relation to academia and the U.S. population in the share of students from underrepresented minorities earning degrees has continued to grow at the undergraduate and master’s degree levels. Since the late 2000s, however, progress in attracting women to the discipline has largely stalled—and among undergraduates actually reversed. The share of women earning bachelor’s degrees in history, for instance, fell below 40% in 2014, for the first time since 1998. In 2004 the share approached 42%, but has been declining slowly ever since. Women account for a larger percentage of advanced degree recipients, but the share earning doctoral degrees has fallen from above 45% in 2010 to below 43% in 2014. At every level, the share of women earning degrees in history is at least 10 percentage points below the average among all disciplines, with the widest difference (17 percentage points) at the undergraduate level. The shares of students from traditionally underrepresented minorities earning bachelor’s and master’s degree in history reached unprecedented levels in 2014, though growth has stalled among doctoral degree recipients since 2007 (Figure 2). In 2014, 15% of the undergraduate degree recipients in the discipline came from traditionally underrepresented minorities—the highest level on record. Likewise at the master’s degree level, the share surpassed 11% for the first time. In both cases, history fell about six percentage points below the average for academia. While the shares of traditionally underrepresented minorities earning history degrees was rising at the other degree levels, the percentage has fallen at the doctoral level. The share climbed above 12% in 2010 before after falling sharply in 2011. Since that time, the percentage has hovered around 11%. While this is well short of the representation in the U.S. population, it is actually close to the norm among all doctoral degree recipients.